It’s a S’More Pumpkin Dessert Buffet! Gather everyone outside for an awe-inspiring scene with pumpkins artfully arranged down the center of the table among marshmallows, graham crackers and lots of chocolate. Can you say S’More Pumpkin please? 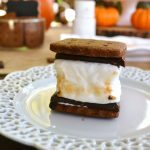 Pumpkins are plentiful this fall season and the inspiration for this pumpkin themed S’more dessert buffet. Who isn’t sweet on S’mores? The smell of hickory burning logs with the crackling sounds of a campfire and the cool crisp fall evening lends the perfect setting for S’more time. Who could resist melted toasted marshmallows and the taste of sweet milk chocolate sandwiched between two honey graham crackers? Simply Yum-a-luscious! Looking to the bounty of the harvest season, pumpkins played a huge role for this table setting. Instead of using a variety of sizes, shapes and colors for this setting, five medium -sized pumpkins were selected for the center of the tables S’more buffet. Hollowed out pumpkins made the perfect container for a can of liquid heat for roasting marshmallows. The center pumpkin served as the pedestal centerpiece for the homemade marshmallows. Long wooden skewers with marshmallows were inserted into the pumpkin for each guest to select for their own roasting. Bowls of chocolate bars, chocolate mints, and dark chocolate pieces, salted caramel, homemade marshmallows, pumpkin spice graham crackers and pumpkin pie spice chocolate chip cookies were arranged in front of the pumpkins for easy help-yourself-service.The recipes for this wonderful S’more buffet include homemade marshmallows and pumpkin graham crackers, pumpkin pie spice chocolate chip cookies and little S’more dippers. Homemade marshmallows will take you into a marshmallow world when you whip up these fluffy pillows of sugar. Unflavored gelatin mixed with hot sugary syrup is whipped in a large mixing bowl then poured into a confectioners sugar and cornstarch bed to rest overnight before cutting. 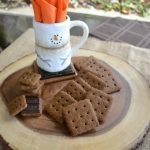 Pumpkin Graham Dippers are 1 x 1-inch square home -made spice graham crackers that are dipped in melted chocolate and tiny marshmallow bites. You can’t make a traditional S’ more with out graham crackers, how about trying a Pumpkin Spice Graham cracker? This recipe is a blend of whole -wheat pastry flour and all -purpose flour, which makes this dough the right consistency and without the strong flavor of whole wheat for a graham cracker. As an alternative to the graham cracker, Pumpkin Pie Spice Chocolate Chip Cookies are packed with roasted pecans and the flavor of pumpkin. A package of pumpkin spice instant pudding and pie mix was added to the basic chocolate chip cookie recipe. 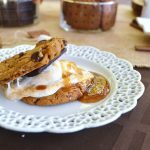 Sandwich these cookies with a toasted marshmallow and piece of chocolate, drizzle with salted caramel and enjoy! Pumpkin Spice Chocolate Chip Cookies turned S’More! Creating a S’ more buffet can be a bit sweet so offer your guests something salty on the side, like pretzels, nuts and popcorn. If you have an outdoor corn popper, pop some corn over a camp- fire for more fall intrigue. Warm apple cider or hot chocolate with your homemade marshmallows would be a wonderful beverage to serve. Lightly spray 8 x 8 inch square metal pan with cooking spray. Sift together cornstarch and confectioners sugar and place in square pan. Cover pan tightly with Aluminum Foil and shake pan to coat completely. Remove foil and sit aside pan. Place gelatin and ½ cup cold water in bowl of stand mixer fitted with whisk attachment to soften. Meanwhile, in medium saucepan, add ½ cup cold water, granulated sugar, corn syrup and salt. Stir to mix, then do not stir, cover pan with lid. Cook for 3 minutes. Remove lid and attach candy thermometer to side of pan and cook over medium high heat until temperature reaches 240 degrees F. (about 7 minutes). Once temperature is reached, remove from heat. Turn mixer on low speed and mix gelatin, slowly add hot syrup to sides of mixing bowl and not on beaters. Once syrup has been added, beat mixture on high speed until mixture is thick and fluffy. Add clear vanilla and beat to blend. When ready, using a wet spatula, spread marshmallow mixture into prepared pan, spread to corners to even mixture in pan. Sprinkle with remaining cornstarch and confectioners sugar mixture over the top of marshmallow mixture in pan. Set uncovered for 5 hours or overnight to set. Run a knife around edge of pan to loosen and turn marshmallow mixture onto a powdered sugar surface. Cut marshmallows into 2- inch squares or desired shapes. Coat cut edges of marshmallows with confectioner’s sugar. Store marshmallows in airtight container up to 3 days. These are fun to make and very delicious! These were cut 2 x 2 inch squares to fit the home made graham crackers but you can cut them any size you would like. Grate butter onto parchment paper and place in freezer to harden 10 minutes. In food processor bowl fitted with steel blade, add all dry ingredients including spices, process ingredients twice at 30-second intervals to blend. Add frozen butter, pulse to combine until mixture resembles corn meal. Add molasses, cream and syrup until dough forms into a ball. Remove from bowl and form into a ½ inch flat disc. Wrap with plastic wrap or parchment and refrigerate to chill 20 minutes. Roll dough between two sheets of plastic wrap or parchment paper to 1/8-inch thickness. Cut crackers using a 2 “ square cookie cutter. Place each cracker on baking sheet. With a wooden skewer poke 9 holes on top- side of cracker to allow air to circulate while baking. Bake 20 minutes. Do not remove crackers from baking sheet until completely cool. Store in sealed container for up to three days. This will soften the cookies. To make mini S’more Dippers, cut graham cracker dough into 1 x 1-inch squares and bake as directed. Dip one end of baked cracker into melted chocolate and roll in purchased tiny Mallow Bites. Tip: Baking these grahams with half flour and half whole wheat pastry flour is the perfect balance for just the right amount of flavor and texture for these delicious crackers. Enjoy! Sift together, pudding mix, flour, soda, spice and salt, set aside. In mixing bowl fitted with beater attachment, cream butter and sugars together until light and fluffy. Add eggs and honey beat until smooth. Add flour mixture and beat until dough forms together. Add chocolate morsels and pecans to dough, mix thoroughly by hand. Using an ice cream scoop, scoop dough into rounds and place on prepared baking sheet or roll dough into 1” balls. Bake cookies at 350 for 7-10 minutes. Using a 1-1/2″ ice cream scoop will make large cookies as seen in the picture for the cookie S’More.